When you are thinking about fun physical activities for kids, keep the age of the participants and their abilities in mind. There are many reasons why regular physical activity is important for children (and their parents). For one thing, playing games and sports helps kids develop their gross motor skills. It helps them to improve their balance, too. When children are brought up appreciating the value of physical activity, they are more likely to continue being active as they grow into adulthood. Regular exercise is one of the keys to reducing the risk of heart disease and stroke. It also helps to achieve and maintain a healthy weight. People who are physically active regularly are able to deal with stress easier than people who are couch potatoes. Since exercise boosts endorphin levels, people who find a physical activity they enjoy may be less likely to get depressed. Before children start doing any of the suggestions listed here, they should do a warm-up activity to get their heart rate up and their muscles warmed up. At the end of the activity session, plan for a period to cool down and relax before resuming normal activities. These fun physical activities for kids can be used for a warm-up or a cool-down. They don't require any special equipment, and children of different ages and abilities can participate equally. When you are looking for ideas for very young children, keep the instructions simple. You want to be sure that they can focus on enjoying themselves, not keeping track of what to do next. Combining songs with simple actions, such as touching the knees or toes can be an enjoyable activity for children. When the weather is fair, plan to spend some time outside. Going for a walk or playing on the equipment at a local playground is a great way to have fun and stay physically active. 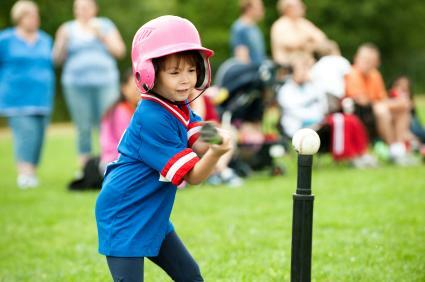 If you think your child would enjoy team sports, by all means consider signing them up for a team. You can also consider enrolling your child in dance, gymnastics, judo or karate lessons to help them keep fit. Not all fun physical activities for kids involve organized sports or lessons, though. Families can spend time together and keep fit by going for walks, hitting the hiking trails, or going for bike rides. Roller blading is another option for keeping kids fit. Simply because your child doesn't consider him or herself to be athletic, it doesn't mean that he or she can't learn how to enjoy being physically active. Toss out the idea of being athletic as someone who participates on a sports team and look for alternative ways that your child can stay fit. He or she may not like traditional sports, but enjoy going bowling or playing golf. Adopt good exercise habits yourself, and your child will follow your lead. Take the stairs instead of the elevator more often, walk to the store if it is close enough instead of taking the car, and park further away from your destination and walk when you can. Have your child take regular breaks throughout the day to stretch and get moving, and make sure that you do the same. Keep the focus on fun, and your children will be able to enjoy being physically active, whether they consider themselves natural athletes or not. They will reap the benefits of a healthy, active lifestyle as they get older.